This spring, the School of International Service (SIS) is pleased to welcome former US Senator from Wisconsin Russ Feingold as a Distinguished Executive in Residence and Dean's Discussion guest. 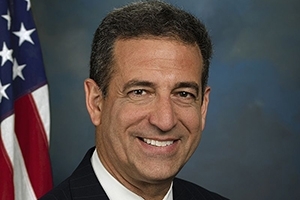 Senator Feingold is best known for his work on campaign finance reform, as a vocal opponent of the Iraq War, and as the only senator to vote against the USA PATRIOT Act. He is a respected voice in both public life and in academia, and is the author of While America Sleeps: A Wake-up Call for the Post-9/11 Era. Senator Feingold will teach a skills institute, titled "Diplomatic Challenges and Skills: Case Study-Great Lakes Region of Africa," about post-1994 conflicts in the Great Lakes Region of Africa. As a United States Special Envoy to the Great Lakes Region of Africa and the Democratic Republic of the Congo from July 2013-March 2015, Senator Feingold offers a unique perspective on international conflict resolution efforts, legal accountability, international peacekeeping, and the conduct of American foreign policy in the region. While the skills institute is exclusive to students enrolled in the course, the SIS community is invited to join SIS Dean James Goldgeier and Senator Feingold on March 1 for a Dean's Discussion entitled "The Undermining of the Legitimacy of the American Government." Dean Goldgeier and Senator Feingold will discuss voting issues, campaign finance and the impacts of the Citizens United decision, the presidency and the Electoral College, and the Supreme Court. In advance of his upcoming skills institute and Dean's Discussion, we asked Senator Feingold to fill us in on his experience as an elected official, his insight on the state of the American government under a new Trump administration, and what's next for the Wisconsinite. Citizens United v. Federal Elections Commission, which struck down some provisions of the 2002 Bipartisan Campaign Reform Act (BCRA), was decided in 2010. We've now had two presidential elections under this new order. In your opinion, what has been the biggest impact of Citizens United? Have there been any outcomes that have surprised you? This was one of the worst legal decisions in American history and was based on assumptions about corporations and elections that were supported neither by the Supreme Court record, nor by the facts in general. I certainly expected the impact of this decision to be severe. Perhaps the biggest surprise outcome is that it is even more severe than expected; as the exploitation of the ruling by powerful, wealthy interests has gone completely out of control (e.g. Sheldon Adelson and the Koch brothers). The two biggest impacts of Citizens United have been, first, to depress the average citizens' view of whether their vote really counts anymore and, second, the public policy outcomes that this kind of activity is "buying" on a daily basis in the Congress. You worked with Sen. John McCain as sponsors on the BCRA legislation for at least seven years prior to its becoming law. How important was it that BCRA was bipartisan, not only for its passage, but for its perceived legitimacy? As you look at the current Congress, do you see any possibility for sweeping, bipartisan action on any important issue? When you're talking about campaign finance and money in politics, it's such a sensitive subject for officeholders. Senator McCain and I found that we absolutely had to have a bipartisan approach or people would be suspicious. The bipartisan effort Senator McCain, I, and others undertook depended on its bipartisan character, not only in order for the bill to pass, but for its legitimacy. We made an effort to bring on a new sponsor only if there was a sponsor from the other party, and this worked very well as we built a balanced team of 10 senators to get the bill passed. Although I am pessimistic about bipartisan action on campaign finance reform in this Congress, I still hope that there will be bipartisan action on issues such as mass incarceration and rebuilding our infrastructure. Senator Russ Feingold meets with President Barack Obama. Photo courtesy of the White House via Senator Feingold's office. In November, Donald Trump defeated Hillary Clinton by just more than 27,000 votes in your home state of Wisconsin. There have been many, many articles written about why this occurred. As a lifelong Wisconsinite, what is your theory? When Washington and powerful business interests failed to respond to Wisconsinites' concerns about their livelihoods, caused in part by bad trade agreements, the electoral consequences ultimately followed. Do you see the current debate about the Electoral College as fundamentally different from previous, similar debates? In your opinion, is the Electoral College necessary? I have reached the conclusion that the Electoral College can no longer be taken seriously in a 21st century democracy. Two out of the last three presidents did not have the support of the majority of the American people who voted. This delegitimizes the presidency and our government. It is time for a constitutional amendment, or some other mechanism, to have the presidency effectively determined by popular vote. It's not uncommon for presidents to issue executive orders, particularly when they enter and exit office. We've seen President Trump exercise this power to make good on some of his major campaign promises. Do you see any significance in his use of executive orders? Clearly the use of executive orders has increased over various presidencies. In some cases, I think it's perfectly understandable, but in other cases it's a way to get around our system of government. Certainly, as a general rule, it is Congress that should be passing laws on most important matters of public policy. Some people say President Obama abused the executive order power, but it feels like President Trump is using this executive order system as a weapon rather than as something to use when nothing else works. President Obama used his power, (although the Court didn't like it) on the immigration issue, but he did it when Congress simply refused to act on comprehensive immigration reform. To me, that's one scenario. What Donald Trump is doing-he's not even trying to put these things through the proper procedure, and I think that's the wrong way around it and it's an abuse of power. Hopefully he'll slow it down-it's only been a few days, but it's been a disturbing few days. What, in your opinion, was the impact of the 2013 Shelby County v. Holder decision on voting in the 2016 election? Shelby County was one of the most troubling Supreme Court decisions in recent years. It gutted crucial provisions of the Voting Rights Act that are still important. I am not certain at this point of its specific impact on the 2016 election, but believe there is no doubt that it is causing harm and needs to be overturned. In light of the Senate's refusal to hold confirmation hearings for President Obama's Supreme Court nominee, Merrick Garland, what do you think Democrats in the Senate should do vis à vis this new nominee? What options are available to them as the minority party? The refusal of the United States Senate to consider President Obama's choice for the high court for nearly a year was outrageous and unprecedented. This action seriously delegitimized the US Supreme Court and our government. All senators, including Democrats, should demand a consensus candidate and not allow President Trump to ram through a nominee on a pure majority vote. While a filibuster has not been used in the past against Supreme Court nominees, the extreme delegitimizing actions of the Senate in the 114th Congress may require opponents to take this step this time. The alternative is a seriously biased outcome on the Supreme Court that could last for decades. 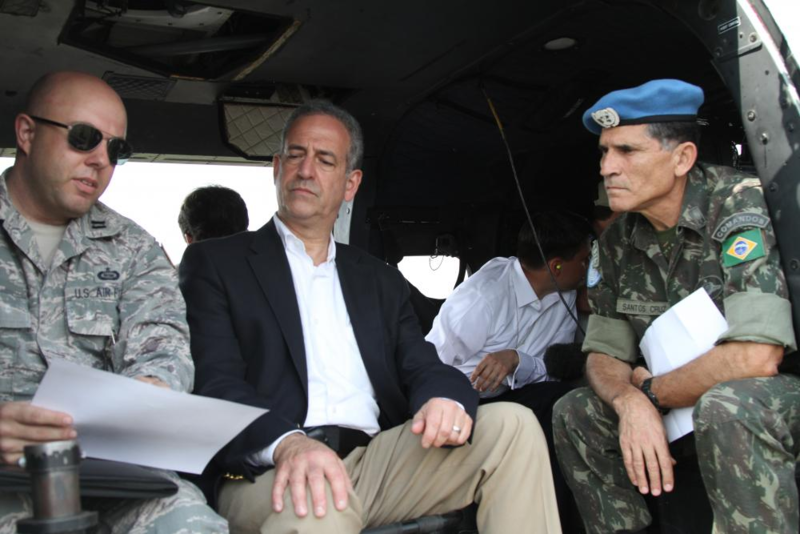 Senator Russ Feingold meets with United Nations officials from the peackeeping force, known as MONUSCO, in the DRC. Photo courtesy of Stuart Reid via Senator Feingold's office. Service is the foundation of the School of International Service. What originally drew you to public service? My interest in public service has to do with the wonderful reception my family received, exactly 100 years ago, when my family moved to Janesville, Wisconsin, as an immigrant, Jewish family from Russia. Even though my father couldn't even speak English-he flunked kindergarten twice, all he spoke was Yiddish-this state and this country really embraced the idea that we should be given every opportunity. I was brought up with the belief that we should not just be grateful and thankful, but that we should, if possible, devote ourselves to public service. I became particularly interested in government and our Constitution because that was a very revered topic in my family. What has kept you in public service? Are there any specific moments from your years in office that stand out as inspiring when your work got tough? After 9/11 when the USA PATRIOT Act was proposed, I was the only senator to vote against it. I felt so strongly that it hadn't been properly considered, that I didn't really think about what the political consequences of voting against it would be. When I went home, I was amazed at how positive people were that I had raised questions about it. Even though no other senator had done it, they said: "That's what we want you do to. Don't just throw away our liberties because it's about terrorists." That was an inspiring thing. It was one of those moments when you feel the Constitution is resilient and, frankly, right now at the beginning of the Trump presidency, I think many of us are very worried about that and I'm hoping that resiliency will show itself again. I feel good [about ]the way people are responding all across the country-all the way from Professor Lawrence Tribe at Harvard Law School to the people who were marching in Louisville-I do think the Constitution will show its resilience. Those are the moments that keep me going: when I see the peoples' commitment to the Constitution. You will be teaching a skills institute here at the School of International Service about peacekeeping and negotiations in the Great Lakes region of Africa. As a former US Special Envoy to the region, what are some of the most pressing challenges the region faces? What are you hoping students will take away from your class? I hope to use the class to discuss skills that diplomats, their staff members, and other people working on international matters may wish to develop. In addition, I hope to convey a sense of the urgency of making more progress for peace and economic development in the Great Lakes Region of Africa. While there are many challenges, I would rank governmental corruption and the need for African leaders to respect constitutional provisions relating to presidential succession to be the most important. I am hoping students will take away some ideas about how they can help the United States help African countries, as well as other countries around the world, in trying to resolve these conflicts. Senator Russ Feingold meets with internally displaced persons and refugees in Rowanda. Photo courtesy of Senator Feingold's office. This won't be your first time teaching in a university classroom. What draws you to education? Public service is one avenue where you can help maintain the commitment to our democracy, our system, and our values. I had an opportunity to serve as an elected official for 28 years. Another place where you can have that impact is by teaching and interacting with young people, about issues like the Constitution and foreign policy toward Africa. For me, it was a wonderful venue and I really have always thoroughly enjoyed interacting with students. It's been some of my favorite work because students are hopeful, they're looking for opportunities, they're looking for guidance on what they should do with their careers, and they're so eager to learn. My first teaching stint was at Marquette University Law School in 2011. I'd say half the students were progressive/liberal leaning and about half were conservative and we had the best time, despite the tensions across the state, treating each other respectfully and learning about the Constitution and the Senate. I found it gratifying and I'm very glad that I have an opportunity to spend a little time at AU. As a progressive looking at the next four years, what gives you hope? I am an optimist by nature, but recent events make that a little bit harder. In the end, though, I believe in the words of a song best sung by Johnny Cash and Hank Williams Jr.: "...that old wheel will roll around again."